EncryptPad is an application for viewing and editing symmetrically encrypted text. 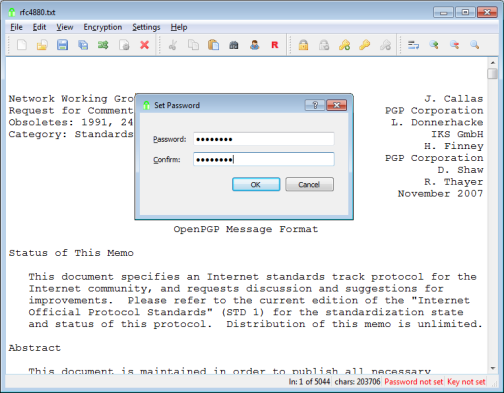 Using a simple and convenient graphical and command line interface, EncryptPad provides a tool for encrypting and decrypting binary files on disk while offering effective measures for protecting information, and it uses the most widely chosen quality file format **OpenPGP** [RFC 4880](https://tools.ietf.org/html/rfc4880). Unlike other OpenPGP software which main purpose is asymmetric encryption, the primary focus of EncryptPad is symmetric encryption. __X2_KEY is a plain text file containing the path to the key if "Persistent key location" in the encrypted file is enabled. Otherwise, it has zero length. 555 856 Evgeny Pokhilko <img src="https://www.oldergeeks.com/downloads/gallery/thumbs/EncryptPad1_th.png"border="0"> Jul 24, 2018 - 11:56 0.4.0.2 13.34MB ZIP , out of 4 Votes.